From day one, start planning to do business without the 8(a) program's assistance and to become a competitive company. Establish a mentor program by developing relationships with leaders of companies inside and outside the industry to help determine how to make the transition to a fully competitive company. Do this either informally through your own industry contacts or through the federal government's mentor program. Build your technical capabilities to win larger contracts because you cannot bid on the same contracts you had as an 8(a) company. Hire the best people possible and give them the resources they need to succeed to set your company apart from its peers. Part of these resources should be established, formalized -- but not overly bureaucratic -- processes for accomplishing your business functions. "By the time graduation came, there was hardly a hiccup" in the transition from the 8(a) program. ? David Gutridge, chief executive officer of MTC Technologies Inc.
Rajesh Soin, founder and chairman of MTC Technologies Inc., credits the successful transition of his defense company from the 8(a) program to a fully competitive, publicly traded company in part to the informal mentoring relationships he formed with both commercial and defense firms. These relationships were just one element the Dayton, Ohio-based MTC used to prepare for graduation from the Small Business Administration's 8(a) program, which helps small disadvantaged businesses compete in the American economy and access the federal procurement market. "By the time graduation came, there was hardly a hiccup" in the transition, said David Gutridge, chief executive officer of MTC, which provides systems engineering, IT, intelligence and program management services to the federal government. MTC planned for its transition out of the 8(a) program from the day the company joined in 1985 -- a year after MTC was founded -- until it graduated in 1994. Soin said a big part of that planning was his informal relationships with leaders inside and outside the defense industry, Gutridge said. Soin sought out executives he met at forums and had informal lunches with them every four to six weeks to discuss business-related concerns, such as how he would set up MTC's internal infrastructure as a public company. He also asked some of them to address his management team, including a former executive at Science Applications International Corp., who talked about how his company operated in a competitive environment. At the same time, Soin started mentoring other 8(a) companies, such as Integrated Information Technology Corp. of Denver, purchased by PEC Solutions Inc. last month, so he could later work with them as subcontractors. "While there was no formal mentorship or advisory board, Raj soaked up the best that each had to offer and added his own twist to come up with his own unique formula that he taught to his management team," Gutridge said. 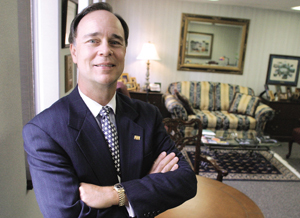 Soin still has lunch meetings with Matthew Diggs, former president and chief executive officer of Copeland, who mentored him, although Diggs is now retired. Don Graber, former chairman, president and CEO of Huffy, sits on MTC's board. Soin also used a three-pronged approach for long-term success that he put into action during MTC's first year as an 8(a), Soin and Gutridge said. The first emphasized winning 8(a) work that required technical capabilities. For instance, whenever MTC had to use a large business as a subcontractor to perform work, Soin positioned the company to attain those capabilities on its own. Building a good portfolio of contracts was the second prong. "As the 8(a) contracts came to an end, frequently the company would be able to move the work to new full and open contracts it had won, or it would be positioned to win a full and open contract for the same work," Gutridge said. The final prong was building an organization and processes to support a larger company before MTC actually needed the infrastructure. "In this way, the company was fully capable to support its dynamic growth as it occurred because the seasoned executives and sophisticated processes were already in place," Gutridge said. The mentoring and advanced planning has paid off. MTC's revenue doubled from $92.6 million in 2001 to $188.7 million in 2003. Last month, BusinessWeek ranked MTC as No. 11 on this year's Hot Growth list of the nation's 100 fastest-growing small companies, with an annual return on invested capital of 32.5 percent over the past three years. Gutridge said he expects the company to see organic growth of 15 percent to 20 percent annually over the next several years, and 30 percent overall annual growth, counting acquisitions. Most defense companies such as MTC have had internal growth of 10 percent to 14 percent a year, with total annual growth of 18 percent to 20 percent, said Randall Scherago, a special situations analyst at First Albany Capital in San Francisco. More than 95 percent of MTC's revenue comes from the Defense Department and intelligence community, including the Air Force, Army and joint military commands. The company has three main lines of business: air forces, land forces and national security programs. To ensure its growth, MTC has embarked on an aggressive acquisition program to help it add a fourth leg of business with civilian agencies. MTC has $30 million left from a second stock offering earlier this year, and an untouched $80 million line of revolving credit that it can use to continue its buying spree. The company maintains a list of 24 to 36 possible acquisition candidates, and at any one time it is pursuing six of them, Gutridge said. While he declined to name specific firms, Gutridge said MTC usually looks for service-oriented companies with strong engineering or IT services or both, a concentration in one of MTC's four focus areas, and revenue of $30 million to $75 million. Earlier this month, MTC completed its $38 million purchase of Command Technologies Inc., a Warrenton, Va., provider of professional and technical services to the Defense Department and national security agencies. It expects CTI to add around $18 million to $19 million in revenue to its second half results. The CTI buy follows purchases last October of International Consultants Inc., a Dayton defense company that supports the Army with program management, IT, logistics and operations, and Vitronics Inc., an Eatontown, N.J., company specializing in research and development, systems engineering, IT, software development and systems integration services. "What they've tried to do through acquisitions is to move into other service arms," Scherago said. "It basically balances the stability if funding mechanisms for any service is cut or hurt." While MTC's acquisition strategy will stay in place for the next three and a half years, Gutridge said the company is not pressed to buy other firms because its internal growth is robust and will remain so. "We've been using acquisitions to gain a business presence and customers and enhance our business with the Defense Department and intelligence agencies," he said.